Located in Wallingford, Oxfordshire, Kirkman Joinery offers a range of bespoke joinery services to both the domestic and commercial markets. We pride ourselves on our versatility in that we are not only able to offer the manufacture and fitting of doors, windows and other bespoke joinery projects, but also offer a range of building services – including kitchen, extension and shop installations. Kirkman is run by a focused and knowledgeable team who are committed to providing you with a faultless service. Throughout every Kirkman Joinery project, our dedicated in-house team take care of everything, a team which includes specialist wood machinists, surveyors and administrators. Whatever project you choose, Kirkman are with you every step of the way, from the initial survey right through to the job’s completion. 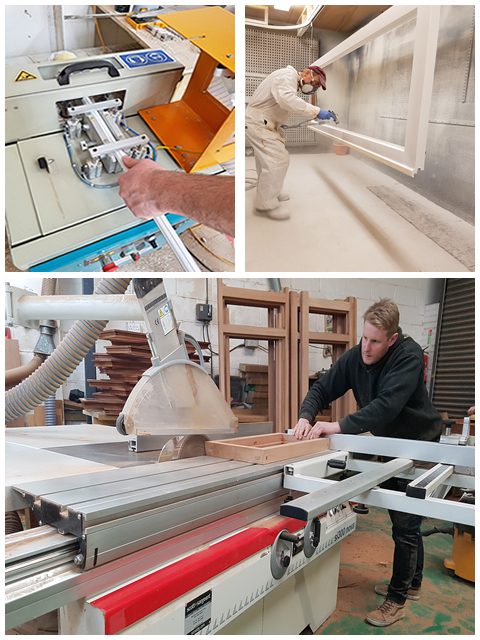 Additionally, we also employ a dedicated paint sprayer who is able to finish our products with a virtually unlimited combination of colours and finishes, offering you truly unique timber joinery products. Because we’re not a corporate giant, we don’t have to act like one – meaning we can offer you exceptional levels of customer service and a completely personalised experience. If you’d like to view our work first hand, we have a selection of product cross sections and hardware examples available to view at our factory. Alternatively, if you’d like to see the manufacturing process, then you can even book an appointment to visit the factory and use our viewing windows to observe our experts craft your bespoke timber joinery. Our range of timber doors, windows and conservatories stand out in a market crowded by uPVC – timeless and authentic.